Ladder Lacing your bodice or sleeves. Sometimes you will come across a lacing style that looks like it has flat horizontal "rungs" only on the outside of the garment. This is ladder lacing. 15th C Flemish gown showing closely-spaced ladder lacing to form a wide V-shape to the navel-lavel. This lacing technique still uses a single lace to draw the edges of the garment together. Holes are placed in horizontal pairs, matching on each side of the garment just like a button and its buttonhole (and the same as for crossed lacing). Ladder lacing is quite different from spiral lacing. Many costume-makers make the mistake of using the spiral lacing technique to lace a ladder-laced garment. When the gap is closed tightly, so you can only see the cord on the outside, it's easy to think this is what has been done. Unfortunately, this doesn't work. 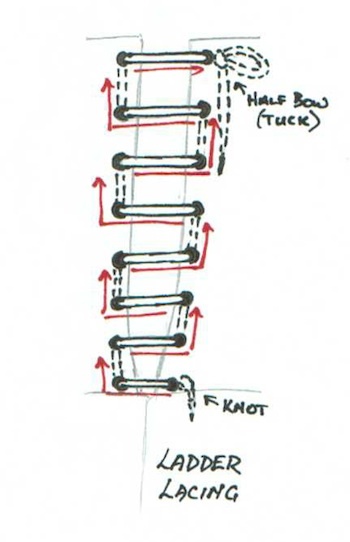 If you use the spiral technique on a garment designed for ladder, the edges will offset, and you'll have a bit at the top and bottom that sits higher than the other side. Very unattractive! This lacing technique is found across Europe from the 14th to the 17th Century, and sometimes later. It's possible that it was used much earlier as well, but I have not found any illustrations showing it. (Please, submit your pictures using the "Ask" form below if you have something earlier, or later!). 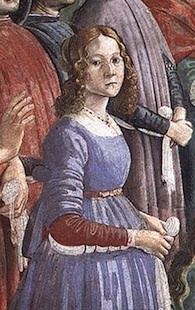 It was very popular for giving a different look to garments in Italy, where wide neck and bodice lines called for the gaps to be laced closed in an attractive way. (above left) Lacing forms an attractive V-neckline on the bodice of a 15th C Venetian woman painted by Carpaccio. 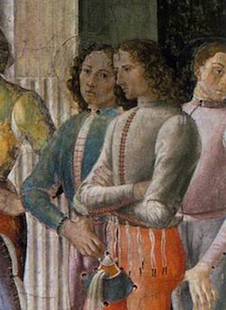 (above right) A painting of men c1490 by the same artist shows more uses for the style. Ladder lacing can also be seen in German Landsknecht Clothing of the early 16th Century. 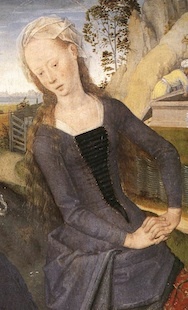 (above left) The sleeve of this woman painted by Ghirlandaio in Florence c.1490 shows this style of lacing (above right) Ladder as an alternative to spiral lacing on a German 16thC. gown. 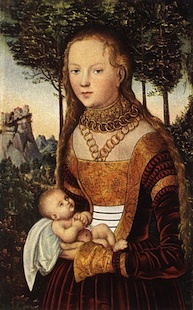 Artist: Lucas Cranach. For a bodice, you will need to use a lace around 120cm long. You might need longer (180cm) if your lacing goes down into the skirt, or if the section to be laced sits wide across the chest or waist, like a German gown. Knot your lace at one end. Choosing one of the bottom pair of lacing rings or holes, insert the other end of the lace from inside to outside and pull through, up to the knot. Carry the end of the lace horizontally across the gap to be closed, and insert the lace in the opposite hole from outside to inside and pull through. This time, take the end of the lace up to the row directly above, and bring the lace through the hole from inside to outside. Take your lace across the gap again to the opposite hole, and insert the lace from outside to inside, and pull up. Continue in this pattern of up (and out), across (and in), up (out), across (in), until you reach the top of the "ladder". create the last "rung" of the ladder by crossing the gap horizontally (to the final hole), and insert the lace from outside to inside. While still holding the end of your lace in one hand, us the other to tighten up the laced "rungs" from bottom to top, until the gap looks the same as your source image, or until it is fully closed (whatever is needed). Tie off your lace on the inside using a half-bow.